Ensuring your Generator is healthy and ready when needed is of paramount importance to avoid interruption to daily operations. But how do you know your generator is being maintained, that there is fuel in the tank or how many hours it has run? Using AKCP’s Generator Monitoring Solution you can now achieve all of this and more. The sensorProbe+ platform (SP2+, SPX+) is the heart of this solution. For low cost, simple installations, the SP2+ can be deployed. A robust and compact device, it can connect with up to 3 sensors and has an RS485 port for connecting with Modbus or Canbus outputs from the genset control panel. SPX+ is ideal where more than simple generator and fuel monitoring is required. Available in custom configurations with additional sensor ports, dry contact inputs and input/output (I/O) modules it provides a complete monitoring solution for remote sites. All sensorProbe+ devices are available with an optional cellular data modem to ensure communications even at sites without a cable connection. The UFLS is installed on standby fuel tanks. Suitable for tanks up to a maximum depth of 2 meters it will constantly monitor the level in your tank and provide you with accurate readings. Know your generator is fueled and ready to go, as well as monitoring for potential fuel theft. Every sensorProbe+ has it’s own web server and user interface, which provides real-time monitoring of the generator and attached sensors. 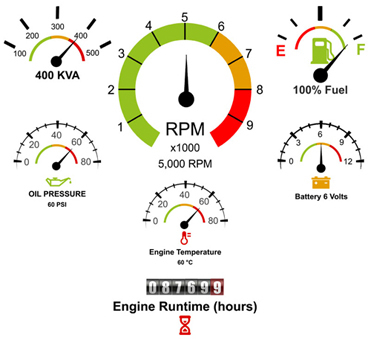 An engine gauge dashboard presents the parameters in a graphical, easy to read format. Graphing of data points, and configuration of thresholds for alerts can all be managed through this user interface. For installations at multiple sites over a wide geographic area, AKCPro Server will manage all your devices from a single user interface. Ideal for centralized monitoring of your infrastructure. Drill down mapping gives an overview of your sites, their locations and ability to zoom in to specific sites. Integration with ONVIF IP cameras gives “eyes on” at each site, with video being synchronized with sensor events. AKCP’s access control solution can be deployed to manage access at each site, and is also administered through this central management software. Keep your generators scheduled and preventative maintenance up to date. Be alerted when a generator reaches a specified number of run-time hours. Never miss an oil change, or put your generator at risk of not being ready just when you need it the most. For generators with an RS485 connection from the control panel, the sensorProbe+ can monitor a wide range of parameters such as engine speed, oil pressure, runtime hours, KVA output, temperatures. Any engine data that is available from your control panel can be monitored from a dedicated graphical dashboard on the sensorProbe+ web interface or, for multiple sites, centrally at AKCPro Server. Not all generators are equipped with an RS485 output. In this case, hardware sensors can be connected to the sensorProbe+. The UFLS is mounted on your standby fuel tanks so you can check on the fuel status, know when to refuel and detect potential fuel theft. Monitor the generator starter battery with the DC Voltmeter to ensure that the battery is in good condition and providing sufficient voltage. Temperature sensors can be deployed in the generator enclosure to alert should the temeprature reach a critical level. Use the AC Voltage sensor to check generator on/off status. It can be used as a feedback to verify AC Voltage is present when the generator is turned on. Power meters, and current transformers can be deployed to monitor power output from the generator and verify engine runtime hours. Invasive and non-invasive ultrasonic fuel level sensors are available to monitor your standby fuel tanks. Suitable for tanks up to a maximum depth of 2 meters, you can keep track of fuel level, usage, and detect potential fuel theft. The sensor connects to an available sensor port on the sensorProbe+ device, and the tank profile can be programmed through the user interface so readings are accurate.